I am leading more to an oxygen show. Didnt a lot of the bad girls were contacted for the mother daughter show that oxygen did months ago? I remmebr Judy saying that. It also can be we tv realated,the hastags of Danni most recent videos is #Oxygen #Wetv. No MTV is under Viacom and Oxygen is under NBC universal. 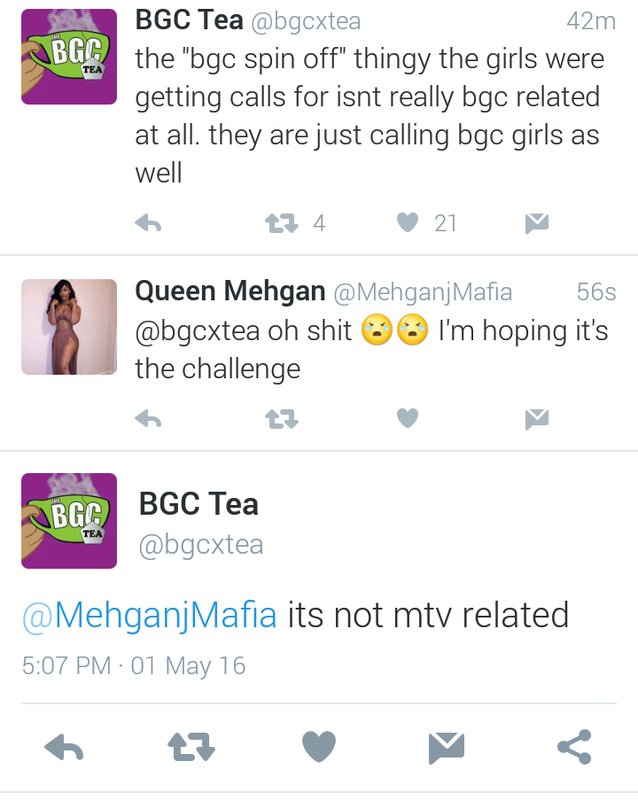 BGCTea confirm is not MTV related at all. So what's the list of girls that are speculated to be there? Right now it seems Danni , Judi and Possibly Venetia and Angela. That looked nothing like Danni, ew. Judi is so tired, ain't nobody need to see her drunk *** on tv anymore. She needs to go to therapy. Why is Erica BGC8 being speculated? THIS. Judi's whole **** got old after BGC7 (didn't watch her Love Games season). If Jela ain't on then I don't care. IMO the best girl they've had on the show since season 9. Judi isn't even entertaining anymore nor is Danni with her new boxed shaped ***. They need to transition to adults with actual careers and give reality television a break. The only person who can hop from show to show is Natalie Nunn because she actually has personality and don't look broke...Maybe it's those trips to her sugar daddy in Dubai but whatever. Judi/Danni have been on everything bgc related Love games, All star battle and redemption. Npw this that is not even bgc related. I don't want to see Rocky I think she comes across very arrogant but she's one of the most insecure girls. She use to talk about Sarah's *** being fake and then she bought one of her own. Oh and she's definitely overrated as a fighter and she did not beat Jenn or Natalie's *** despite what the crazy fans say. Rocky got cuter again after she suddenly turned straight again and got rid of her man hair cut. I can deal with her as long as she doesn't get all the screen time and act like the Queen. She said she'd do bgasb again but with a new format lol. Danni swore she wasn't returning to Oxygen on her YouTube.. lol she's grown on me through out the years but I'd rather her go with Gabi than be alone. Are you guys sure Judi is even on it? Watch this be some ******* tripe like that Sweet 16 show from years ago. Erika with the whole everything pierced?? i hate that *****. If it's not BGC related then what the hell could it be about and are they even gonna mention anything bad girl related? And Judi is so tired and her antics are not funny anymore. It could be like one of those battle of the the network things they used to do on Bravo.